Amazing start of one of my favourite book series of all times. Lunar chronicles is one of the few book series, when books get better thought series; first one being the weakest of the bunch and the last one Winter (Winter) one of the best books ever. Author has amazing ability to make story complex, intertwines with more characters thought the books, giving each one enough time to make you love them all. Ok, back to Cinder. Whilst the weakest in the series, still not bad by any measures. This is story place in the future, where humans have populated Moon and evolve to be a bit different from humans on earth. The world is united against Moon, but still divided on 6, (if I remember correctly) countries/monarchies. In New Beijing (most of today Asia, I presume) lives cyborg Cinder, with step mother and two step-sisters. She is cyborg. She is used, basically a slave to the family, only one working, bringing in the money. There is also the plague killing people left and right. Story begins when her step mother "volunteers" her to government program, to help cure the plague (by testing potential cures on cyborgs mostly).Where she meets prince and the story really start. 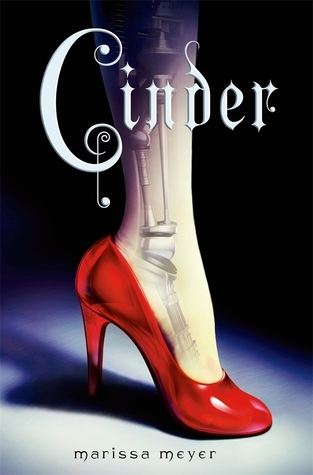 It is based on Cinderella fairytale, but put into futuristic world, with cyborgs, plagues and a lot of cool lunar stuff. The author manages to take simple fairytale and give it depth and many layers-political, economical, ethical, without taking away the original charm of the fairytale. Pretty amazing. It takes a bit for story to pick up, but page after page it keeps on getting better. All in all- good start of an amazing book series.